Angela's heels clacked on the pavement. Through the rehabilitation center's glass doors she could see Duncan waiting in his wheelchair. His faithful attendant, Jerry, hovered behind the investigator. Duncan took in the details of his approaching girlfriend's appearance. Angela made him want to leap from his seat. He didn't require a wheelchair, but the clinic's policy demanded he be pushed from the facility. He still limped, but he'd worked hard in rehab, focusing on his future, and had recovered faster than anyone thought possible. Angela tried to make it to Edinburgh every other weekend to encourage Duncan and keep him company. She stayed with the family, but the Dewars made themselves scarce at the therapy center when she visited, giving the couple time to be alone. The Scotsman extracted a promise from the lass that when he was released, she would greet him and take him home. He hadn't seen her in three weeks and couldn't wait to hold her in his arms, away from the hospital. As Angela drew closer to the doors, Duncan's grin grew by degrees until the muscles in his cheeks ached. She had almost reached the entrance when he noted a startled look on her face, then a crowd rushed between them and blocked his view. Storming through the sliding doors, a noisy group of a dozen people charged towards Duncan. Bright lights from flashing cameras went off, producing temporary blindness. Confused, the investigator had no idea what was happening. "Here he is, boys. The hero of the UK," a vaguely familiar female voice rose above the din. "How does it feel to find redemption?" "When did the two of you get back together?" "How do you plan to spend the reward money?" "Have you had any contact with Caroline Menzies?" "How did you keep your relationship hidden from the public?" Questions fired like bullets from an automatic weapon at Duncan, who remained blinded from the brilliant bursts of light. "Now, now. Can't you see he's tired? Pictures only, boys. That's what we agreed upon," the female voice said. He turned his head to see who was orchestrating this gang of what he now understood to be reporters. As his pupils dilated and his vision returned, he saw who spoke. There, dressed in a strapless, dark brown leather bustier with matching skirt and spike-heeled boots, towered Cassandra Baines. Her platform stilettos raised her to well over one and a half meters, giving her a height advantage. The former model stepped next to Duncan, bent at the waist, and planted a kiss on the investigator's cheek, angling herself to the cameras, allowing the photographers an ample view of her bosom. Duncan squirmed away from Cassandra as best he could, seated in the wheelchair. It didn't occur to him to get up and leave. His old girlfriend draped her arm around the investigator and pulled him close, sitting on the edge of his chair, as cameras flashed, lending the drab lobby the lighting of a discotheque. "That's it boys. Clear off," Cassandra ordered as a security officer for the hospital approached the group. The reporters dissipated as quickly as they'd arrived, leaving Duncan alone with Cassandra and a stunned Jerry. The Scotsman scanned the room for Angela, but she was nowhere to be seen. "What do you think you're doing?" Duncan asked, incensed. Cassandra's smile transformed into a hurt expression. She jutted her lower lip forward in an exaggerated pout. "Just helping you get back on your feet. Imagine the publicity this will generate for your consulting venture. Now, everyone knows you're here to stay. You should be thanking me instead of scowling, Poppett." Cassandra bent over Duncan and, placing a palm on each side of his jaw, attempted to draw him into a full blown kiss. "Uhm, uhm," someone cleared their throat behind Cassandra. Duncan jerked his face free while Jerry looked on, bemused at the scene. Cassandra straightened to her full height and turned to see who dared interrupt her mini-tryst. "Excuse me," Angela said in a business-like tone, stepping to one side and then moving her body between Duncan and the former model. "Are you ready?" his girlfriend asked with a pleasant voice, smiling at both the investigator and Jerry while ignoring the woman. He tried to keep his eyes off Cassandra, but gave her a sidelong glance as Jerry wheeled him from the lobby. His old girlfriend tapped away on her mobile phone, ignoring their procession. Duncan couldn't remember the last time he felt so awkward. Everything happened so fast. What must Angela think? Jerry, who by now had collected his thoughts and formed an opinion on the scene in the lobby, saw Duncan into the passenger seat of the car. Duncan said his good-byes and thanked his attendant. Jerry gave him a wry smile, as if to say Now you're in for it, before shutting the vehicle's door. Duncan studied Angela. Her hands trembled at the wheel. "I'm sorry, Angela. I had no idea that was coming." "Just what was that?" Angela asked, her eyes trained straight ahead. "I don't know. I suspect Cassandra is trying to cash in on the media attention I've had since the story broke about the treasure at Lindisfarne. I tried to get away from her." Duncan had been instrumental in discovering a lost hoard of riches, hidden by the monks on Holy Island hundreds of years before. His recent case had almost cost him his life and when the press got hold of the details, Duncan featured prominently in their headlines. Years before, he achieved brief fame for a breakthrough technique he'd invented employing mathematics in accident investigations. It was then he'd dated Cassandra Baines, a well-known model in the UK. "That's not what it looked like," Angela said, her voice full of anger. The lass flashed her cellular at Duncan, who took the phone in his hand. There, on the on-line page of Edinburgh's leading rag, was a photo of the investigator leering at Cassandra's cleavage with a pleased expression on his face. In reality, the camera angle affected the photo; he had tried to pull away from the model with a look of disgust, however, that wasn't the story told by the picture. It appeared Duncan drew back for a better look at the beauty's figure, his visage reflecting nirvana. "That's a delirious smile if I've ever seen one," Angela commented as she drove the vehicle from the car park. Duncan thought at light speed. He needed to dig himself out of this hole as fast as possible. "Now, Angela, can't you see I'm an injured man? I've just been released from hospital. I had no idea she would show up. I was looking forward to seeing you come through those doors. I'm a weak and helpless invalid. In fact, you could have your way with me now, quite easily," he said. Humor always appeased Angela. "If I had my way with you at this moment, you'd be on that curb over there, thrown on your duff!" Angela retorted, pointing to the pavement as the vehicle rounded a corner. Maybe humor wasn't the way to go. Victoria Benchley lives with her husband of over twenty years and their two children on the West Coast of the United States. She started reading the classics at an early age, as a way to avoid chores, and counts Dickens and the Bronte Sisters as her favorite authors. 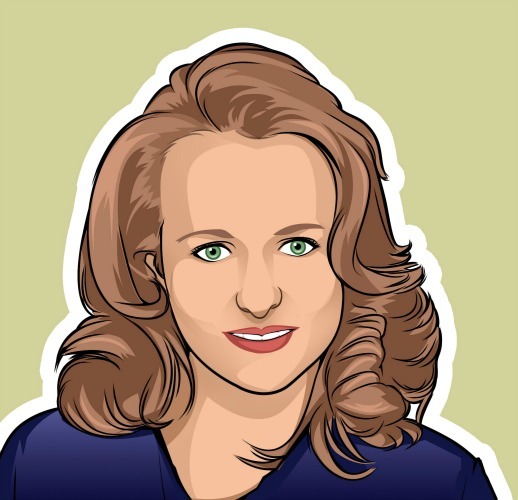 After a career in corporate America, spanning public accounting, cash management, and real estate investments, at national and international firms, she chose to become a stay-at-home mom and full time taxi cab driver for her children. Victoria is the author of the Duncan Dewar Mysteries and a stand alone novel, The Snail Man. Inspired by her travels and Scottish relatives, she enjoys creating stories set in Scotland and Europe. She is a Christian and enjoys quilting, cooking, and traveling (including road trips! ), as well as reading and writing. On Sunday afternoons during football season, she can be found enjoying an NFL game. V. Benchley: My latest book is The Christmas Contest. A new adventure in the Duncan Dewar Series, this novel is two parts romantic comedy and one part mystery. The reader gets to experience Christmas and Hogmanay in Scotland with the Dewar family and their friends. As usual, the characters find themselves in a bit of a muddle. Recovering from serious injuries sustained during his last case, and hoping to nurture his fragile relationship with Angela, Duncan and his family decamp for a relaxing Christmas holiday in the village of Taye, Scotland. Joined by the irascible Chef Mondo, their stay ends up being a whirl of festivities, food, misunderstandings, and a jewel heist. But it's not just about Christmas in Taye. The village council is out to make a name for the town by hosting an elaborate Hogmanay celebration, complete with ancient traditions. Is Duncan up to the ultimate contest for Angela's heart? This good natured romp through the holidays will warm your heart as you join the Dewar family and their friends for an experience not to be forgotten. IAN: Is The Christmas Contest published in print, e-book or both? V. Benchley: The Christmas Contest is available as an e-book. IAN: What inspired you to write The Christmas Contest? V. Benchley: I am of Scottish descent. I remember many of my relatives, and their writings, mainly humorous poetry, survive. Their wit and love of family, along with my own travels to Scotland inspired The Christmas Contest. Also, their holiday recipes played a role in the inspiration and feature prominently in some of the competitions in the book! V. Benchley: I’m afraid I winged the first draft. I start with an idea, or rough outline, in my head, and just begin writing from there. The characters often take me in an unplanned direction! 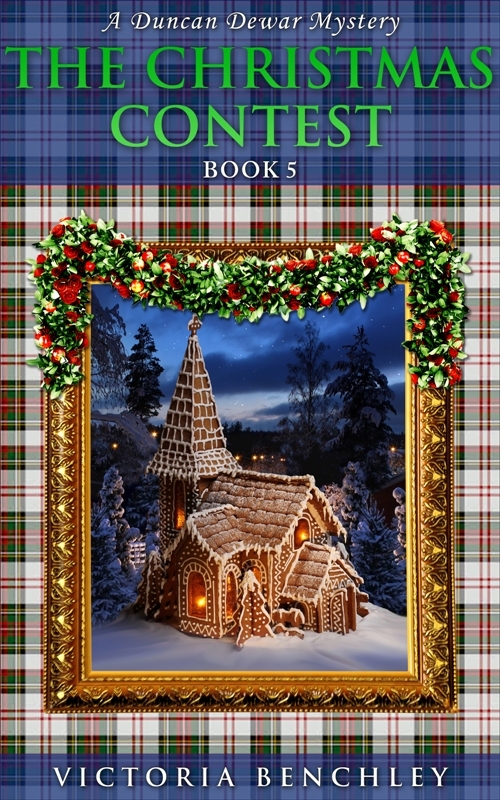 V. Benchley: The Christmas Contest is Book 5 in the Duncan Dewar Mysteries Series. I began writing immediately after I completed Book 4. I believe this helped the process along, because I completed the first draft in two months. V. Benchley: I mainly write in a third person limited mode. Occasionally, I employ the third person omniscient limited style. This helps the story along when my main character is out of commission, or details from another's thoughts add richness to the narrative. I grew up reading these styles, so that is what comes naturally to me. V. Benchley: The Christmas Contest is a holiday themed novel. There are several competitions going on at once in the book, some not so obvious and only revealed at the end. I've left it up to the reader to determine which was the real contest referred to in the title. Each character has their own challenges or game to win. V. Benchley: I hope my readers will enjoy many laugh out loud moments and grow more attached to the characters of this series. I also trust the novel will help put them in the holiday spirit. IAN: How much of The Christmas Contest is realistic? V. Benchley: The Hogmanay traditions mentioned in the book are all genuine, although some are no longer practiced. The area of Scotland where the story takes place is real, as is Scotland's history with the Christmas holiday. As far as the romantic comedy aspect of the book… well, let's face it, fiction is sometimes better than fact! V. Benchley: I have travelled to all the locations mentioned in my books and/or have had a loved-one reside there. One of the experiences Duncan has in The Laird's Labyrinth actually happened to me while staying in the same area! What was the hardest part of writing your book? I find the most difficult part of writing most of my books comes midway in the process. I feel as though I have to grind out about one fourth of the book. Once over that hump, things flow pretty well. However, I never went through that rough patch with The Christmas Contest, perhaps because it starts up where The Laird's Labyrinth lets off. V. Benchley: I'm kicking around several ideas for my next Duncan Dewar Mystery. Will Duncan choose the village life of an innkeeper over Edinburgh sleuthing? What events or people from his past come back to wreak havoc on his professional and personal life? Will he and Angela get around to tying the knot? In addition, I plan to begin work on a new mystery series. I am currently busy developing the characters for this exciting venture. 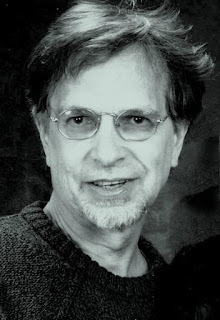 PJ McDermott was born and bred in Scotland. After leaving school at sixteen, he worked in various jobs on building sites and in factories before he learned to play guitar and began performing in pubs and clubs around town. At twenty-one he returned to college and from there went on to Glasgow University, where he eventually graduated Bachelor of Science. IAN: Please tell us a bit about your books. Commander Hickory Lace of the Alien Corps. The Corps has been searching for an interstellar messiah since the discovery of an ancient manuscript in Turkey eighty-four years before. 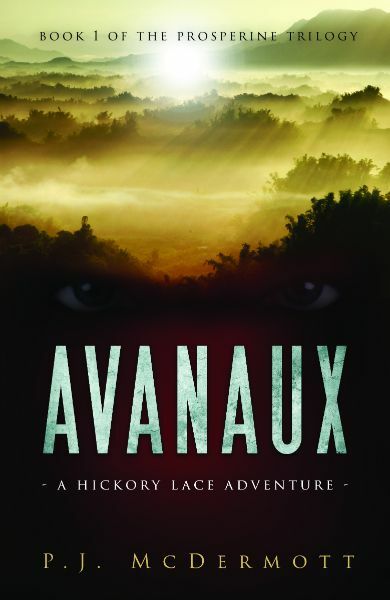 In Book 1, Avanaux: A Hickory Lace Adventure, Hickory meets up with the mysterious Teacher and foils a plot by alien mercenaries to steal Prosperine’s precious resources, a key ingredient for FTL fuel. ‘Erlachi ’takes place six months later. The fabled Sword of Connat-sèra-Haagar has been stolen and Hickory and her team have been ordered to find it. Their search takes them deep into the high mountains of Erlach, where they discover that their arch-enemy, Sequana, is rallying the northern tribes to war. As well as overcoming the dangers in this hostile environment, Hickory and her team must restore the rightful king to his throne, and rescue the Teacher if they are to retrieve the Sword and stop Sequana. 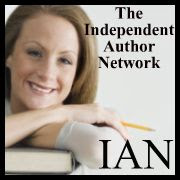 IAN: Have you published your books in print, e-book or both? PJ McDermott: Avanaux is available as an e-book and in paperback. 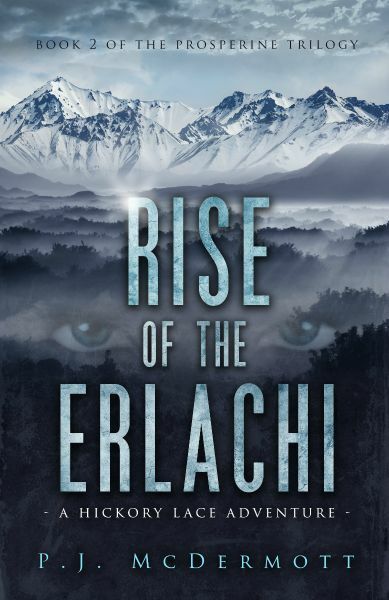 Rise of the Erlachi is currently available only as an e-book. A paperback edition will be available in the next few weeks. IAN: What inspired you to write The Prosperine Trilogy? PJ McDermott: After writing the gritty coming of age novel Small Fish Big Fish under the pen name Jacob Carlisle, I felt I needed a change to something lighter. Fish was the book I had to write, if you know what I mean, but it took me four years and it was hard! As a teenager, I devoured science fiction stories by authors such as Asimov, Niven, Le Guin, Herbert, Huxley and many, many others. I loved the genre and found it a great escape from the boredom of school. That love of SF has stayed with me throughout my life. (I still watch re-runs of Dr Who! ), and so after Fish, I decided to try my hand at creating an SF story with a difference. IAN: What do you hope readers come away with after reading The Prosperine Trilogy? PJ McDermott: The Trilogy has a religious premise, but it’s not a spiritual book—it’s an adventure story. The character of the Teacher is loosely based on Jesus and I play with the idea that perhaps he may be one of many Sons of God sent to save intelligent beings on other worlds. I guess I’d like my readers to reconsider the universe-centric mindset of mankind and our ideas about God. But if they just enjoy the story that’s great! IAN: How much is realistic? PJ McDermott: My background is in science, so I’ve tried to be credible with my world building, for instance the parts about faster than light travel and Avanaux’s climate. I don’t go in for magic wands as a solution to difficulties characters might find themselves in, but in other areas I let my imagination run free. The plants and animal life (as well as the natives) are colourful and, well—alien, and probably break quite a few of the laws of nature. IAN: How did your interest in writing originate? PJ McDermott: I read with envy about those authors who began writing as a seven year old and just kept going! I didn’t discover my love for writing until late in life. I’d already enjoyed successful careers in business when I came down with cancer (not once, but twice). Thank God I’m cured now, but it certainly gave me pause to think what I was doing with my life. I realised that I wanted to lease some sort of legacy for my children and grandchildren to remember me by. I joined a professional writing class and loved it. PJ McDermott: I wish I had started writing earlier. I feel there are a lot of stories inside me, desperate for expression. So, yes, I do see writing as my career. I will write for as long as I get pleasure from it and for as long as people want to read my work. Does that mean I will make a lot of money from my writing? Ha! I wish. IAN: Did you learn anything from writing these books? PJ McDermott: Heaps of things. I did an enormous amount of research into archaeological discoveries in Turkey, the bible stories, history. In terms of the business of writing, this is a whole new industry and it takes time to understand how it works. Not just the writing (although development of those skills is one of the most exciting parts of learning) but everything to do with self-publishing—cover design, formatting, writing promotional blurbs, marketing and promotional opportunities etc. PJ McDermott: Following on from above, writing can sometimes be a lonely experience. The best advice I can offer anyone starting out is to realise that good writing takes time to develop. Find yourself a professional writing group in your local area and one or two via the internet that fit your needs and aspirations. Listen to more experienced writers talking about their challenges and how they overcome them. This will same you heaps of time and heartache. The other piece of advice is don’t stop. Write as much and as often as you can and share it with others. IAN: Do you have anything you would like to say to your readers? 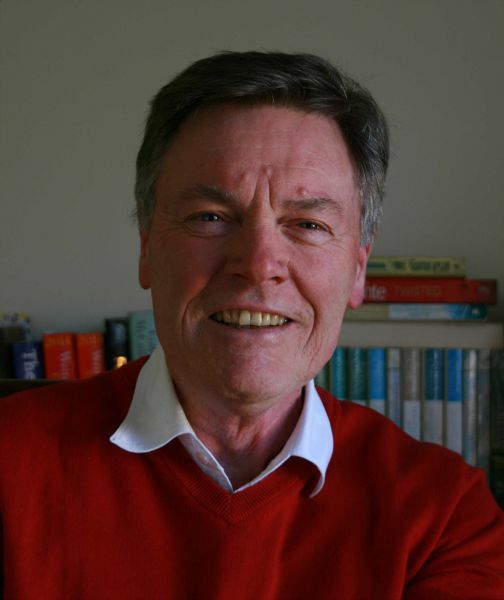 PJ McDermott: Without readers, a writer is nothing. The most delightful moments in my life as an author are when a reader tells me they appreciate my work. Writing, like other creative arts, comes from the heart. A book is like a child, born of many months of labor, and every parent loves to hear others praise their new-born! So, if you enjoy my books, please leave a review. Better still, drop me line. You can contact me on pjmcdermott.author@gmail.com with any questions or suggestions you might have. I'd love to hear from you. PJ McDermott: I’m currently working on a first draft of book three of the Trilogy, tentatively titled The Scarf. Some of the questions readers might have about Hickory’s birth father (who apparently died in a car crash back on Earth. No spoilers!) and about the Teacher will be answered here. There will be, of course, action and intrigue aplenty.